A device that will capture the event, a video camera or mobile phone for example. Live Streaming Sever, Oculu provides that service but you can use your own if you want. A web page you want your audience to watch your live stream. 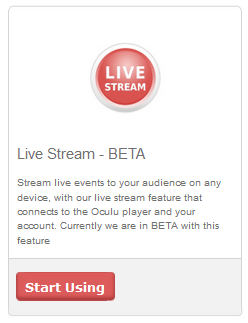 To setup live stream you first need to loging to youre Oculu account and got to “Features” tab. Click the “Start Using” button on the Live Stream icon and it will take you to the Live Stream dashboard where you can manage your live streams. On the Live Stream dashboard page you will see all of your live streaming events that you created. You can manage them by using the buttons on the right side of each live stream list. To add a new entry click the “Create Live Stream” button on the bottom of the list and it will give you a form where you can input all necessary data. Live Stream Name : this will be the name/title of your live stream and it will appear on the top of your preview page. Description : make a short description of your live stream (it will also appear on your preview page). 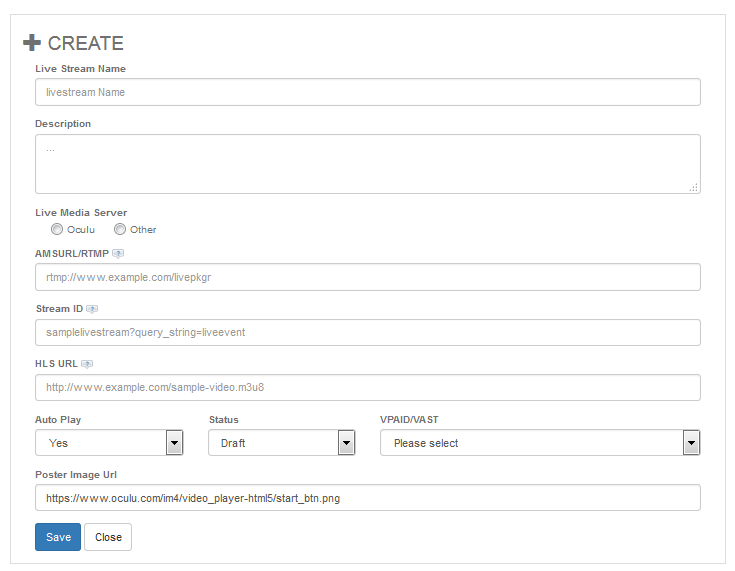 Live Media Server: If you select Oculu we will auto fill the rtmp, stream-if and its inputs. If you select other you have to fill each field with your information ( as its required ). RTMP, Stream ID , HLS : required inputs which will be the url of your media for flash / html5 formats. Autoplay : If you select yes video will auto-play when the page loads (if there is no poster image selected). If a poster image is selected users will need to click to play. Status: You can set your stream status to publish or draft, select publish if you want to make the livestream active / draft if inactive. VPAID/VAST: Select ad that you have added to your account if your want to show pre-roll ads on your live stream. Poster Image Url: this will act as play button if you want your livestream to be click to play. If your are new to live streaming and not familiar with RTMP, Stream ID, and HLS click the tooltip and it will provide more information. Once everything is final hit save button and it will be added on your live stream list.